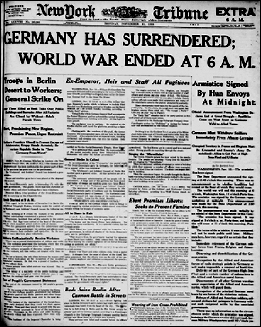 Image: “Germany Has Surrendered,” New York Tribune, 11 Nov 1918, p.1; digital images, Chronicling America: Historic American Newspapers, Library of Congress (http://chroniclingamerica.loc.gov/ : accessed 10 Nov 2017). Your mention of the three day holiday debacle brings back memories. The WWI and WWII vets in my area were very much insulted by the Monday holiday law on two counts: first, that it severed the holiday’s link to the historic significance of the 11th hour of the 11th day of the 11th month; and more importantly, that it seemed to have been motivated by commercial interests in order to encourage people to spend the day shopping instead of honoring those who had put their lives on the line to defend our country and our people from those who would take away the independence our forefathers struggled so hard to obtain. The vets just went right on holding their parades and commemorative events on November 11, just as they always had, and the public stood with them. As a result, for six or seven years until the law was changed back, we had two holidays instead of one. How sad that so many of them are no longer with us. Hats off to them and to all the veterans of all our wars.